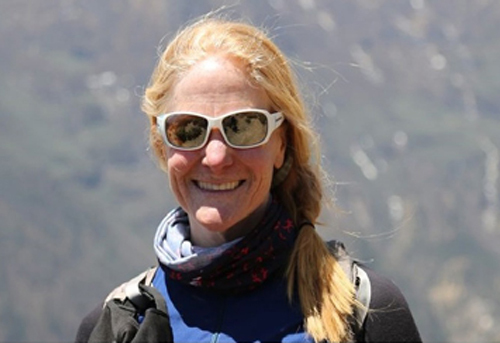 Carole Tejas has been climbing and trekking all over the world for over 25 years and has been guiding professionally since 2009, most recently for Alpine Ascents on Mt Elbrus, Mera Peak, Kilimanjaro, Aconcagua, and the Everest Base Camp Trek. Although she is based in the urban canyons of New York City, Carole considers the Khumbu Valley in Nepal to be her second (and spiritual) home. She has explored every corner of the Khumbu and has formed many close relationships with the Sherpa people living there. Over many years, she has immersed herself in Sherpa culture and has spent time studying Tibetan Buddhism and the Nepali language. Wherever she may be, Carole loves spending time off the beaten path, and in addition to Nepal has climbed and trekked in Bhutan, Ladakh, Indonesia, Laos, Colombia, Ethiopia, Mali, and the Comoros Islands among other far-flung places. Raised on the East Coast, Carole’s passion for mountaineering started in her local playgrounds — the White Mountains of New Hampshire and New York’s Adirondacks and Catskills. She has worked with climbers of all levels of experience, but particularly enjoys teaching novice climbers how to be comfortable and self-sufficient in the mountains. When not working, Carole loves to play on rock, snow, and ice while traveling the world with her husband Vern.